Hot Wheels® Partners with Dale Earnhardt, Jr. for Ultimate Design Experience | Mattel Inc.
EL SEGUNDO, Calif.--(BUSINESS WIRE)-- In time for back-to-school, Hot Wheels® today announced that it has teamed up with NASCAR superstar, Dale Earnhardt, Jr., to design his ultimate Hot Wheels® dream car, the "Hammerhead," along with a corresponding line of licensed apparel. 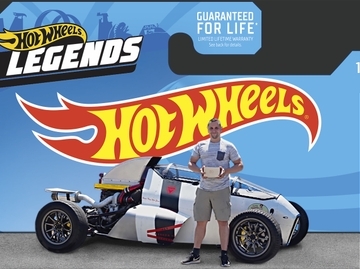 For more than 40 years, Hot Wheels® has been passionate about bringing thrilling vehicle experiences through innovative product and storytelling. And now, fueled by Earnhardt, Jr.'s passion for NASCAR and its true grit roots, this collection includes a variety of kids t-shirts and pajamas featuring modernized versions of iconic racing cars complete with edgy graphics and thrill-seeking phrases, all of which harness the imagination of boys around the world. 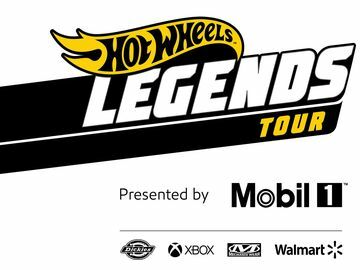 "Hot Wheels and racing are about the thrill and spirit of competition," said Simon Waldron, vice president of marketing for Hot Wheels. "By teaming up with Dale, we are offering fans a rare glimpse into the creative mind of one of automotive sports' influential contributors." Earnhardt, Jr. worked closely with the Hot Wheels® design team to bring his ultimate dream car fantasy to life. The "Hammerhead," one of his childhood nicknames, features classic '50s hot rod meets '60s muscle car styling - with an edge. With twin turbo V-8s this car is ready to race! "I've grown up around cars all my life and played with Hot Wheels as a kid," said Earnhardt Jr. "It really was a once-in-a-lifetime experience to design my own Hot Wheels car. The design team was incredible to work with. It became clear that there are no boundaries with them. Wherever my imagination took me the designers could meet me there." Hot Wheels® has had a long-standing history of participating in the automotive racing world — from sponsoring the Snake and Mongoose rivalry of the NHRA® to sponsoring Jack Baldwin's car in the 1992 Trans-Am Championship, to Kyle Petty's NASCAR sponsorship during the ‘90s — plus an exclusive line of die-cast models for the sport. Collaborating with Earnhardt, Jr. furthers the evolution in bringing Hot Wheels® fans of all ages new ways to play and support their favorite celebs in motorsports. Last year, Hot Wheels® teamed up with Danica Patrick to create the first celebrity-designed Hot Wheels® car — the Danicar. This year's program for the first time expands beyond toy to include a line of licensed apparel and accessories for a celebrity-designed lifestyle experience. PLEASE VISIT WWW.HOTWHEELSMEDIA.COM FOR ADDITIONAL PRESS INFORMATION AND HIGH RESOLUTION IMAGES. Since 1968, Hot Wheels® has been passionate about creating thrilling vehicle experiences through innovative product and content. With a fan base of more than 41 million people, Hot Wheels® is the No. 1 vehicle property in the United States producing the coolest cars imaginable. The Hot Wheels® brand began as a line of 16 1:64-scale die-cast vehicles; today, it has evolved into a true, global lifestyle brand for boys of all ages with segments that range from aftermarket parts to licensed apparel to branded digital content from Team Hot Wheels™, a real-life race crew of professional drivers performing over-the-top stunts. For consumers to learn more, visit www.HotWheels.com and www.Facebook.com/HotWheels.